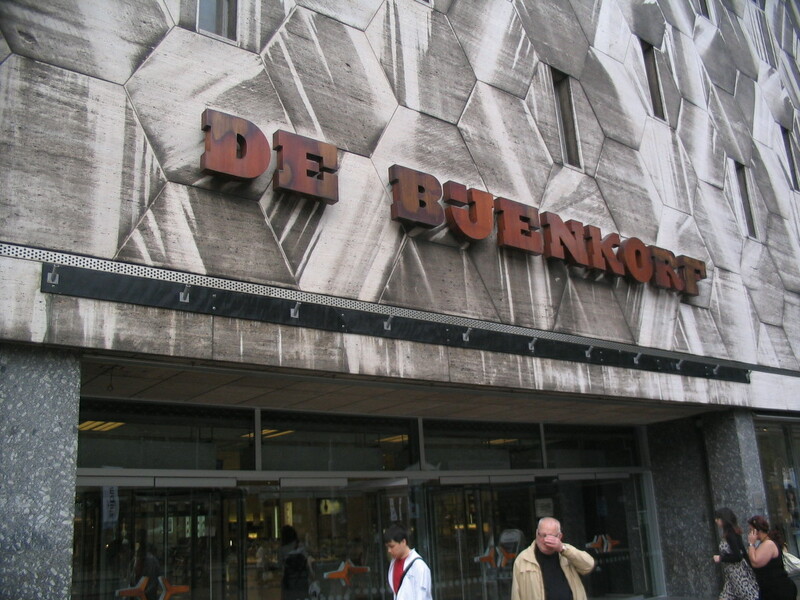 We continued exploring the diverse streets of Rotterdam. 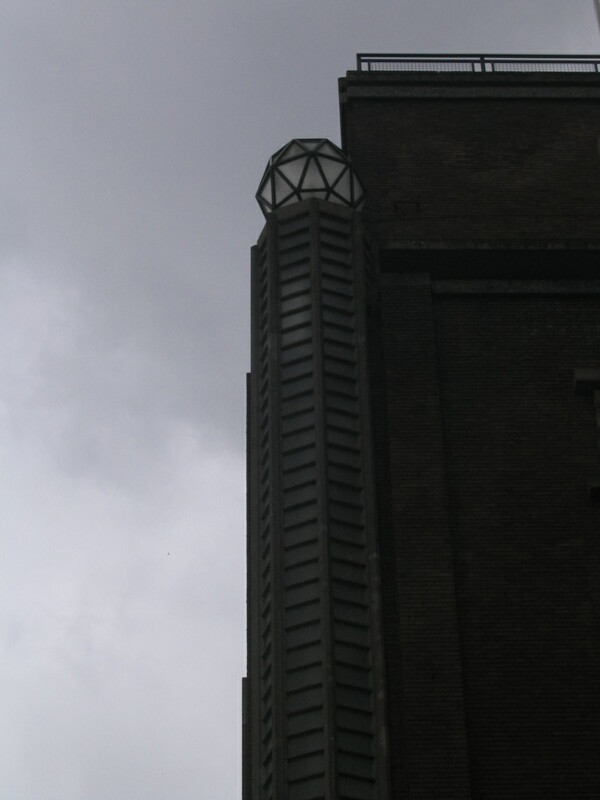 The interplanetary beacon of the Atlanta Hotel along Coolsingel, designed by F.A.W. 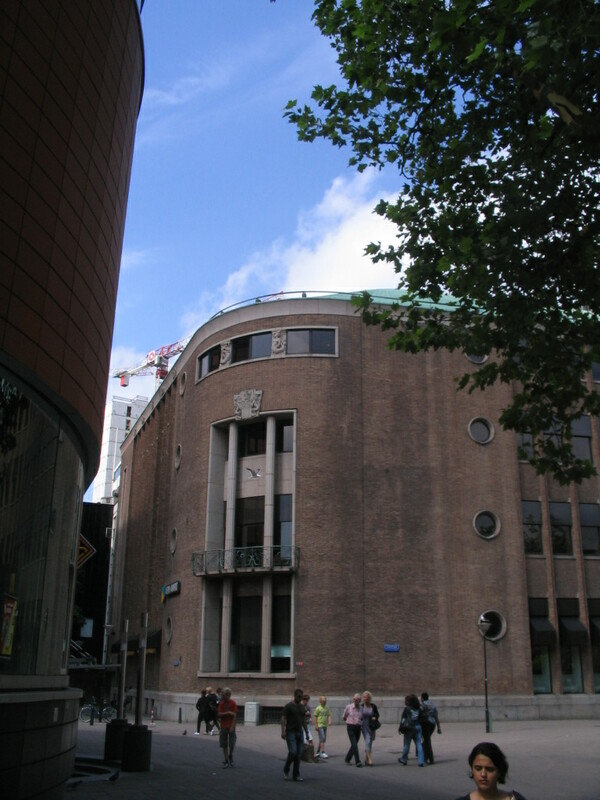 van der Togt and completed in 1931. It survived the wartime bombing. 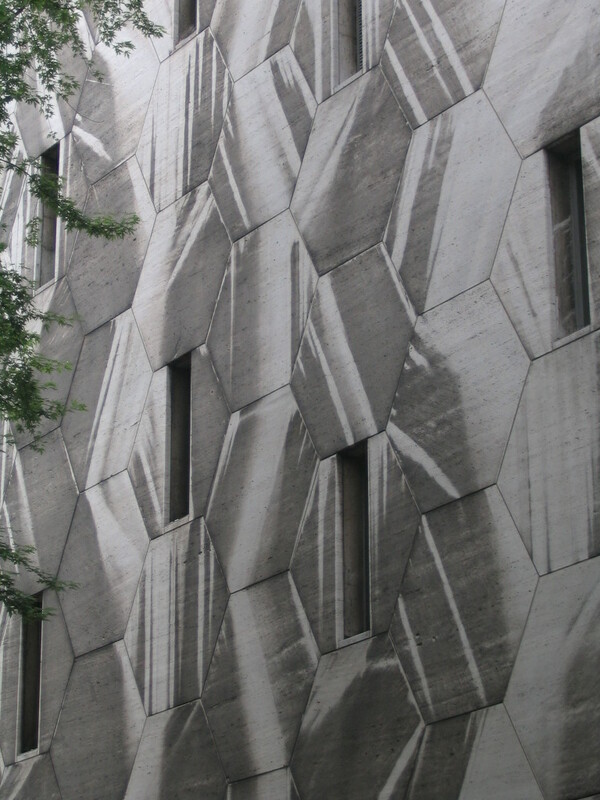 This wall of hexagons that appear to have been sliced out of the original Doctor Who title sequence is the wall of Rotterdam's De Bijenkorf store, the current version designed by Marcel Breuer after the original one was destroyed in the war. I have not yet figured out why the stones have those striations. If you know why, holla at me! I love the shape of these letters and the consonance between the sturdiness of the letterforms and the sturdiness of the weathering steel they're made of. 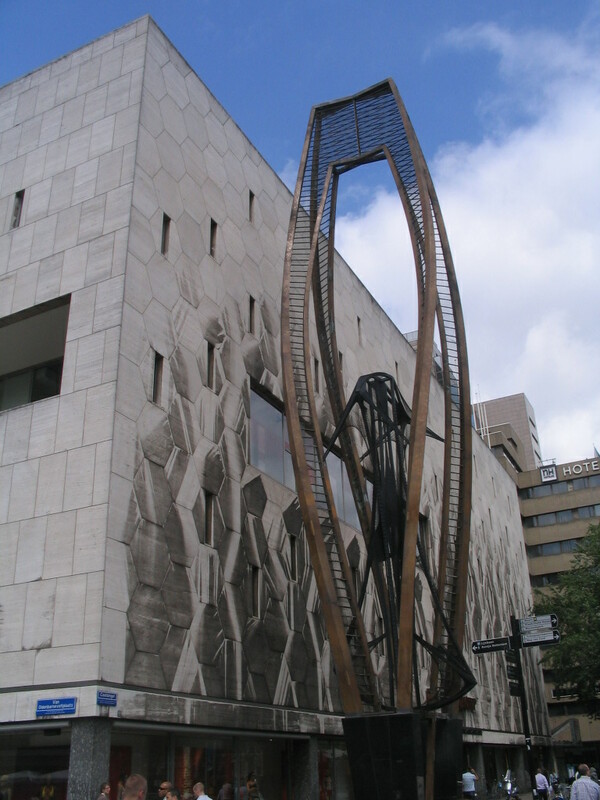 Right next to De Bijenkorf is the fanciful-yet-mathematical Gestileerde bloem (Stylized Flower) by the Constructivist sculptor Naum Gabo, created in 1957 for the rebuilt Bijenkorf. 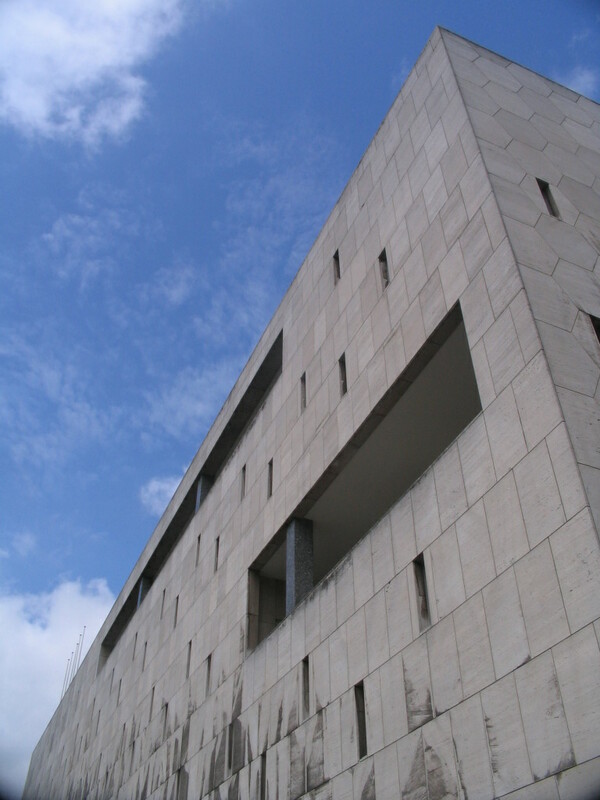 Cool stone against a cool sky. 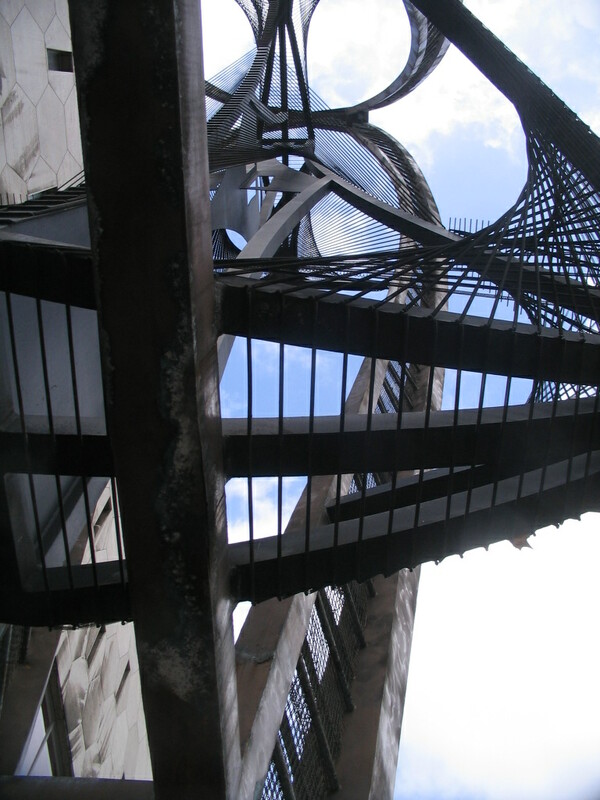 Here's a somewhat more comprehensible view of Gestileerde bloem in all its intricacy. Lots of convexity a little further down Coolsingel. 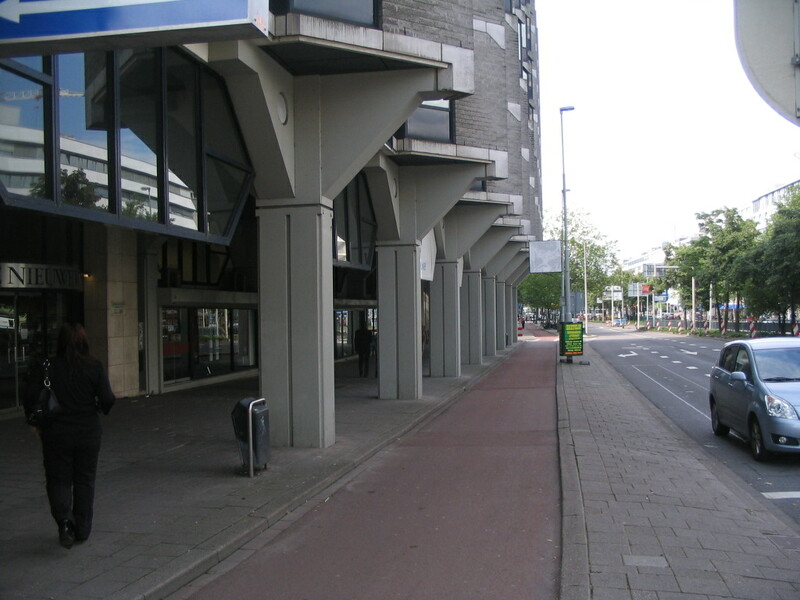 At the Churchillplein: these piers make this building look like a Brutalist version of the Amsterdam Carlton. 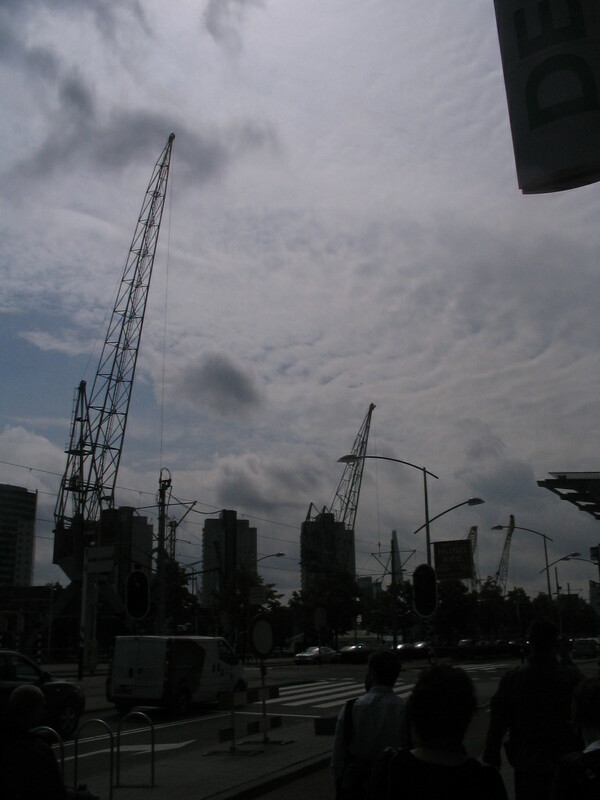 By continuing along Schiedamsedijk, the continuation of Coolsingel, we ended up down by the Nieuwe Maas (New Meuse), the waterway that forms the backbone of the city, where ship cranes loomed. Note that the Nieuwe Maas is actually mostly a distributary of the Rhine rather than the Meuse! 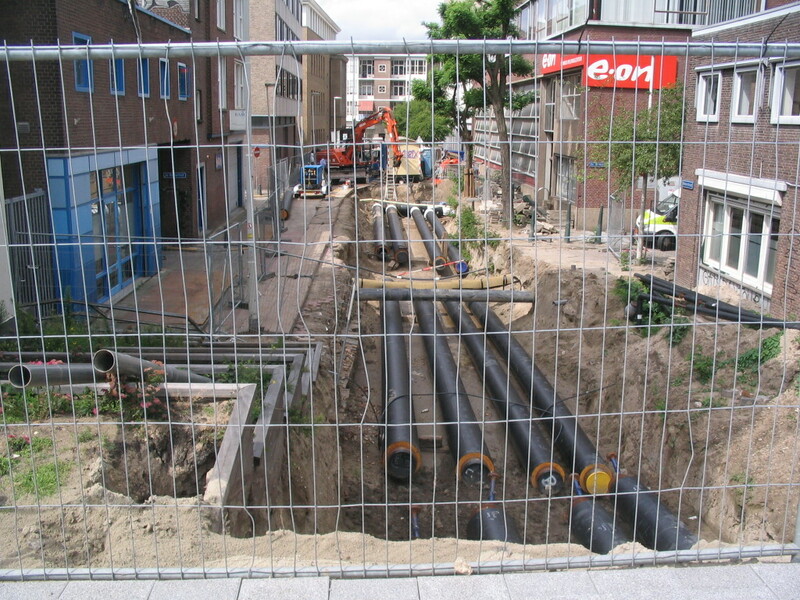 Oh well, guess we can't go down Blekerstraat. Those terraced flowerbeds were making a valiant effort to survive. 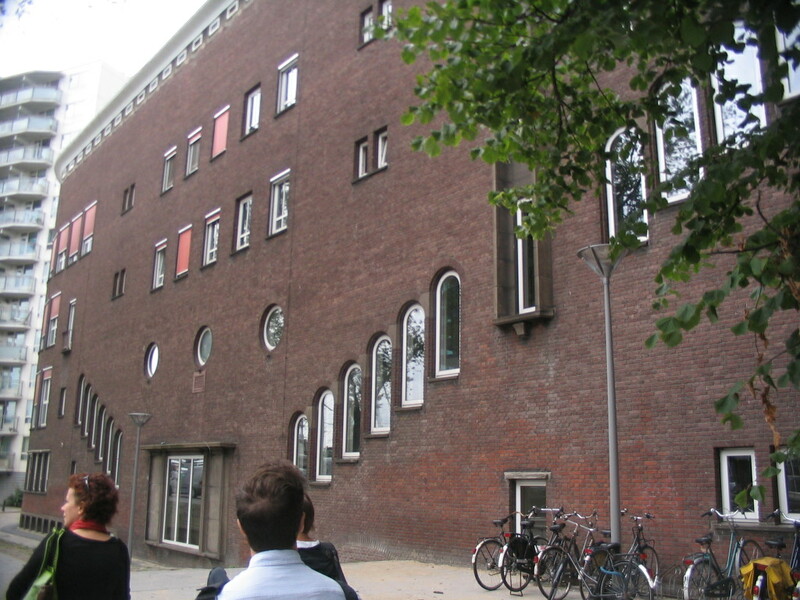 Where Schiedamsedijk meets and ends at the short boulevard Vasteland (which means "mainland", not "wasteland") stands a mysterious building with record-breakingly curious fenestration. 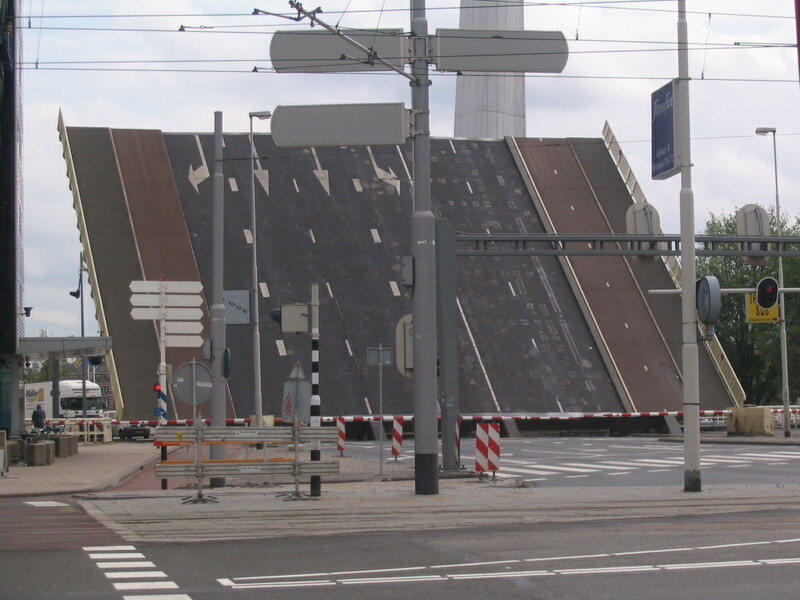 Meanwhile, across the way, the Nieuwe Leuvebrug lifted up just like the top of a school desk. A huge school desk with roads on it. 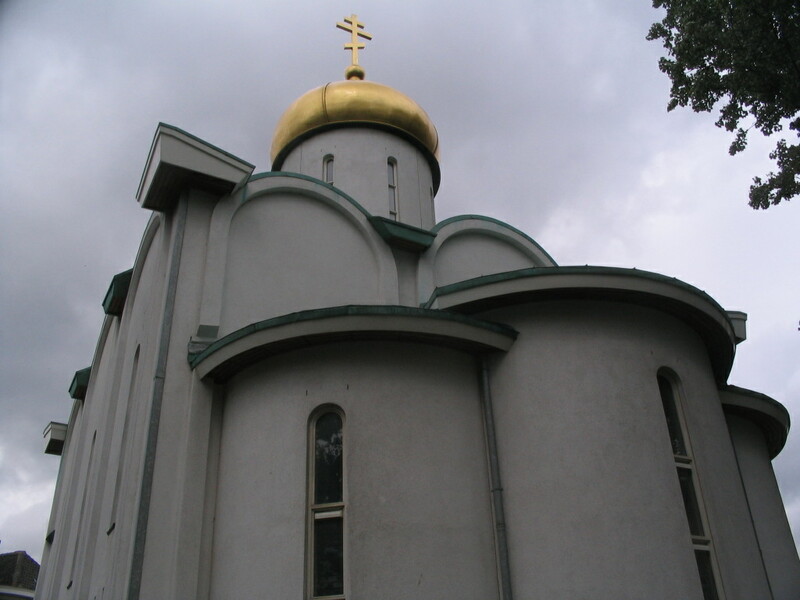 At the corner of Vasteland and Schiedamse West, this quite compact Russian Orthodox church sits contentedly surrounded by greenery. 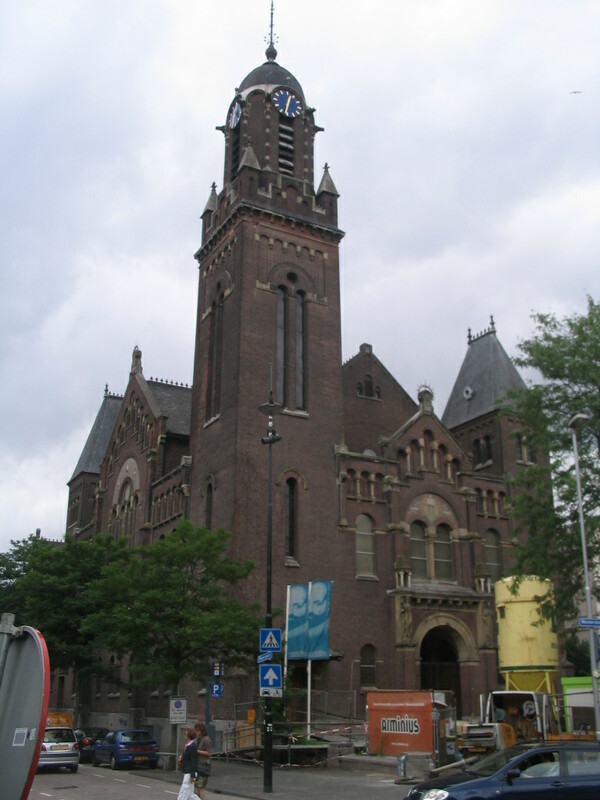 Our main destinations were a few museums in the museum-laden Museumpark, which also hosts this former church and later cultural center Arminius, designed by Henri Evers and J.P. Stok in a quite Romanesque take on Jugendstil, and completed in 1897. Arminius faces the Westersingel just south of the grass-and-brickscape we had walked along earlier.